Blood flows to the retina (which is made of nerves) through arteries and veins. In diabetes, blood flow can get choked off, so the nerves do not receive enough blood. 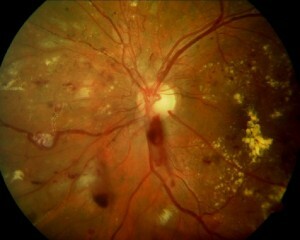 The term for this is diabetic retinopathy, and involves several different types of complications. Nerves that lack blood can swell, and swollen nerves do not see well. Choking nerves cause arteries and veins to grow new blood vessels (neovascularization). Unfortunately, these new blood vessels are never healthy, and they invariably to leak and spill blood into the middle of the eyeball. 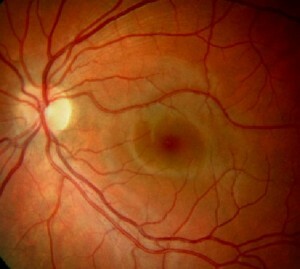 Diabetic retinopathy can be treated by destroying choking nerve cells with laser. Swollen nerves often improve if certain medications are injected into the eye.